The complete play translated into plain English. It's 11th century Scotland. Macbeth, Thane of Glamis, is one of King Duncan's greatest war captains. When Lady Macbeth hears this, she is determined to push her husband to take fate into his own hands and make himself king by murdering Duncan. Macbeth is reluctant to harm Duncan. But, when the King makes arrangements to visit Macbeth's castle, the opportunity presents itself. To everyone else, it looks as if the sons have been the chief conspirators and Macbeth is crowned King of Scotland. Banquo's suspicions grow, based on his encounter with the witches and Macbeth is wary of the second prophecy concerning Banquo's offspring. In revenge, Macbeth butchers Macduff's entire household. 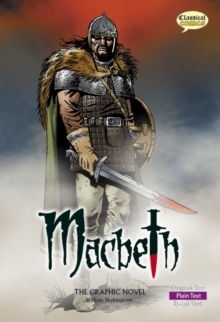 Macduff and the King's sons raise an army in England and march against Macbeth, who is given another prophecy by the witches, as he prepares for the assault. She sleepwalks and eventually kills herself. Macbeth learns that many of his lords are deserting and joining Malcolm's army, which approaches Dunsinane under cover of boughs, which they've cut from the trees of Birnam Wood. Macbeth and Macduff eventually meet on the bloody battlefield.